Production Company: Renaissance Pictures, Starz! Five minutes into the first episode of Ash Vs. Evil Dead, I had already decided that this was my new favorite television show. Everything you need if you love horror/comedy is packed into this forty minutes of pure joy. Thirty years after the events of Evil Dead 2, Ashley ‘Ash’ J.Williams has been hiding in fear, living in a trailer park. While intoxicated and trying to impress a woman, he reads from the Necronomicon. This summons the Deadites, and they are looking for some revenge. 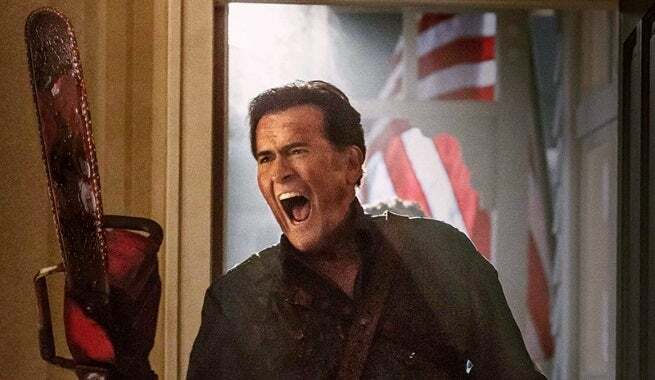 A real ladies man, Bruce Campbell is brilliant as the cheese-ball department store clerk turned Deadite-destroyer. This show is refreshing and nostalgic all at once. If the rest of the series is as good as the pilot, I have one word; Groovy! Completely agree! This also has become my new favorite show! It was everything I wanted and more!